Posted on January 16, 2019 by Staff & filed under Nevada by the Numbers Blog. • The 10-year U.S. Treasury Yield closed the year at 2.69%, down from a high of 3.24%, as recent as November 8th. We’ve been talking about rate increases for years now and rates are primarily driven by the 10-year UST. Looked like we finally saw it in 2018, until a late year downturn in the stock market drove yields back down. Although down from the high, yields were still up 29 basis points in 2018 (2.40% close of 2017). • The 30-Day LIBOR continues the steady rise it’s been experiencing since mid-2014. 2018 brought exceptional upward movement and the rate increased nearly 100 basis points. A number of bank originated loans have rate adjustments tied to LIBOR. If this is the case for you, it may be worth getting ahead of the game and trying to lock in a long-term fixed rate priced over a US Treasury Yield. • The Federal Reserve bumped their target rate 4 times in 2018, the most recent on December 19th, and has hinted at 2 additional rate hikes in 2019. Prime Rate which is tied to the Fed Funds target rate is now 5.5%. The Fed Chairman, Jerome Powell, will remain flexible if they perceive problems in the financial markets. • US Stocks posted their worst year since the financial crisis. The Dow closed down 5.6%, the S&P was down 6.2%, and the NASDAQ was down 3.9%. 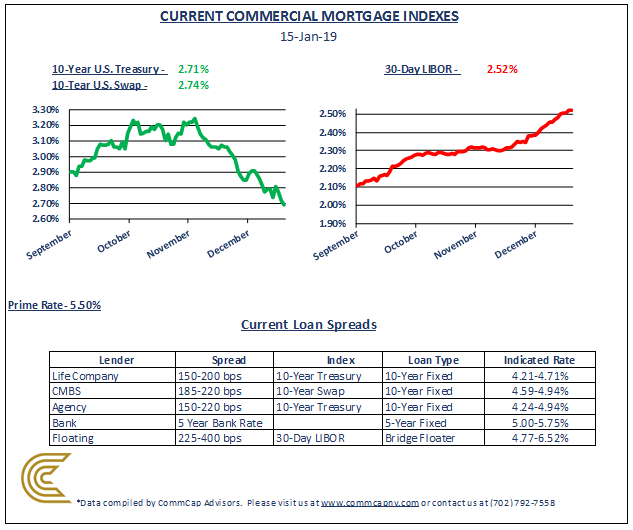 In summary, the 10-year UST continues to make long term commercial real estate loans attractive. If you’re looking to refinance or acquire an asset, the dip in Treasuries may make it a good time to take advantage of rates. Who knows when yields will get back north of 3.0%…?